You are here: Home / Blog / Yakima Wildflower Hiking Series! Join Foothills hike leader and photographer Chris Pribbernow for a fun series of hikes through beautiful desert wildflowers in the Yakima Canyon! This spring wildflowers are at their peak in the desert country of the Yakima Canyon! 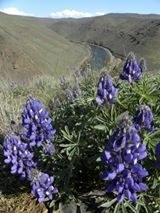 Join Foothills hike leader and photographer Chris Pribbernow for a fun series of hikes through beautiful desert wildflowers in the Yakima Canyon! Chris will be leading a series of hikes in this gorgeous country, with views from Mt. Stuart to Mt. Hood. Take a look at a few of the hikes that are posted right now... including a possible camping cookout in the Yakima Canyon on the night of Saturday April 18 !